Neonatal stridor and Staphylococcus aureus: Are they related? Staphylococcus aureus septicemia in the neonate can be complicated by the development of pneumatoceles. Affected infants usually present systemically unwell with raised inflammatory markers and worsening respiratory failure. We report the clinical progress of an extremely premature infant born at 25 weeks' gestation diagnosed with invasive S. aureus septicemia, previously stable on noninvasive respiratory support, who developed acute onset stridor on day 14 of antibiotic treatment. Further evaluation demonstrated a large pneumatocele in the right lower lobe with associated deviation of the major airways. Distortion of his trachea and right main bronchus by the pneumatocele was felt to be the most likely explanation for the acute onset of stridor. Intubation and ventilation was required for respiratory support at this stage. Of note, while there had been an acute inflammatory marker rise at the onset of the septic episode, by the development of acute stridor this had normalized, and clinically there were no acute respiratory concerns for this infant. To the best of our knowledge, this is the first reported case of a pneumatocele presenting with stridor. This case highlights the need for vigilance in extremely preterm infants with S. aureus septicemia and an awareness that pulmonary complications may arise during the recovery phase of such septic episodes. Staphylococcus aureus septicemia in the neonate can be complicated by the development of pneumatoceles. We report the clinical progress of an extremely premature infant born at 25 weeks' gestation diagnosed with invasive S. aureus septicemia, previously stable on noninvasive respiratory support, who developed acute-onset stridor on day 14 of antibiotic treatment. A premature male infant was born by vaginal delivery following spontaneous preterm labor at 25 + 1-week gestation. The mother received antenatal steroids, and he was born in a reasonably good condition. He was intubated at 7 min of age due to poor respiratory effort and received surfactant for respiratory distress syndrome. He was ventilated for 24 h and extubated to biphasic continuous positive airway pressure (CPAP). On day 12, he was weaned to high-flow nasal cannula. On day 21, he was reventilated due to increasing apneic events. Peripheral venous blood culture was taken at this time, and endotracheal aspirates were positive for S. aureus. Chest radiograph did not show a primary respiratory focus for his sepsis. He was initially treated with vancomycin and gentamicin as per unit policy which was subsequently changed to intravenous flucloxacillin based on microbiological sensitivities. He received a total of 14 days of treatment. He had a C-reactive protein rise to 108 mg/L [Figure 1] during this septic episode. There had been improvement in both clinical and biochemical parameters with treatment, and he was extubated to biphasic CPAP on day 29. 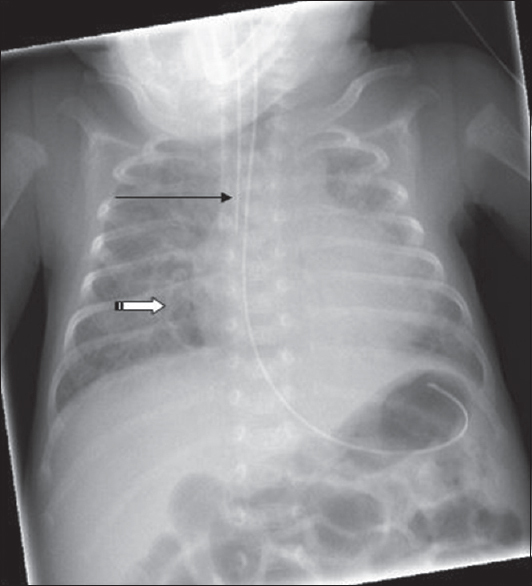 On day 33, a small right-sided pneumatocele was noted on chest X-ray (CXR) [Figure 2]; however, he remained clinically stable. On polymerase chain reaction testing, the blood culture isolate of S. aureus did not carry the gene for panton–valentine leukocidin, which has an association with increased virulence and staphylococcal pneumonias. On day 36 of life, he had a sudden onset of biphasic stridor with increased work of breathing and increasing oxygen requirement. He did not respond to higher pressures on biphasic CPAP and an anti-inflammatory dose of dexamethasone. Intubation and ventilation was required for respiratory support at this stage. A CXR at this point demonstrated an enlarging pneumatocele on the right side with associated deviation of the major airways [Figure 3]. Postintubation CXR showed stabilization of the airway and unchanged appearance of the pneumatocele [Figure 4]. There were no clinical features of sepsis or rise in inflammatory markers; however, in view of the enlarging pneumatocele, empirical antibiotic treatment with vancomycin and gentamicin was recommenced which was subsequently changed to flucloxacillin as his respiratory status improved and blood culture was negative. He received a total of 14 days of treatment. He was extubated on day 44 to biphasic CPAP. The CXR, at this point, appeared to show the resolution of the pneumatocele. Subsequently, his respiratory support was gradually weaned, and he was self-ventilating in air by day 60. Due to clinical and radiological improvement, further chest imaging and bronchoscopy were not undertaken. No further episode of stridor was noted. He was thriving well, and there were no further episodes of sepsis, and hence, he was not screened for immunodeficiency. Pneumatoceles (also known as pulmonary pseudocysts) are thin-walled, gas-filled cysts that develop within the lung parenchyma. Pneumatoceles can occur at all ages from infants to adults and may be solitary or multiple lesions. The etiology of pneumatoceles includes congenital, traumatic, postinfectious, hydrocarbon ingestion, and ventilator induced. Recent case reports involving neonatal pneumatocele formation are described as a complication of pneumonia. It is reported to occur after infection with S. aureus, Streptococcus pneumoniae, Enterobacter cloacae, Escherichia More Details coli, Klebsiella pneumoniae, Pseudomonas aeruginosa, or Mycobacterium tuberculosis.,,,, The infant described had two risk factors as follows: positive pressure ventilation and S. aureus sepsis. He has received surfactant, lung protective ventilation, and there was no radiographic evidence of any pneumatocele, air leak, or cystic lung lesion before the S. aureus infection. As a result, the most likely etiology for the pneumatocele, in this case, appears to be the S. aureus sepsis. Biphasic stridor suggests severe, fixed airway obstruction at the level of the glottis, subglottis, or upper trachea. Loud stridor, especially when associated with retractions, occurs with significant narrowing of the airway. Causes of stridor vary according to the site of obstruction (nose and pharynx, larynx, and trachea). Distortion of trachea and the right main bronchus by the enlarging pneumatocele as evidenced in the CXR was felt to be the most likely explanation for the acute onset of stridor in this case. There have been previous case reports of mediastinal structures such as bronchogenic cysts, vascular rings causing compression, or distortion of trachea resulting in stridor in neonates.,,, To the best of our knowledge, this is the first reported case of a pneumatocele presenting with stridor. Subglottic stenosis secondary to prolonged ventilation, multiple endotracheal intubation, or traumatic intubations can cause stridor. However, our baby had only two brief periods of ventilation before this event, and on both occasions, intubation was atraumatic and no difficulties described. Moreover, his subsequent clinical course did not show any evidence of subglottic stenosis. Bacterial tracheitis is a cause for stridor in pediatric age group, and S. aureus is one of the most common causative agents. On average, children with bacterial tracheitis are 4–6 years of age and may follow viral croup or starts resembling viral croup with fever, cough, and stridor. 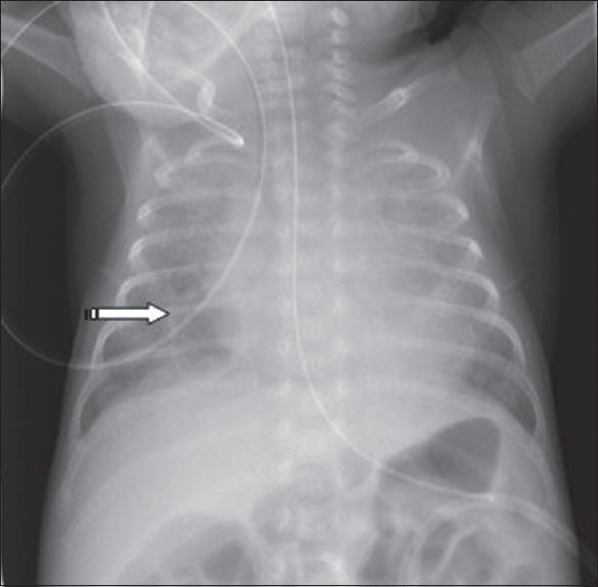 Infants affected with bacterial tracheitis have fibrinous (pseudomembranous) swelling of the mucosa of the subglottic region extending into the trachea. Our patient did not display any of these clinical features, did not respond to anti-inflammatory dose of dexamethasone, and had no obvious edema, membrane, or difficulty noted during intubation. Of note, while there had been an acute inflammatory marker rise at the onset of the septic episode, by the development of acute stridor this had normalized, and clinically there were no acute respiratory concerns for this infant. The endotracheal aspirate taken shortly after the onset of the septic episode grew S. aureus, and that could have been an early warning of a focal pulmonary infection despite an improving inflammatory marker. Infants with S. aureus infection developing pneumatoceles can remain clinically well with normal inflammatory markers. The authors would like to thank the parents who consented for the poster publication of this case report. Quigley MJ, Fraser RS. Pulmonary pneumatocele: Pathology and pathogenesis. AJR Am J Roentgenol 1988;150:1275-7. Hussain N, Noce T, Sharma P, Jagjivan B, Hegde P, Pappagallo M, et al. Pneumatoceles in preterm infants-incidence and outcome in the post-surfactant era. J Perinatol 2010;30:330-6. Clarke TA, Edwards DK. Pulmonary pseudocysts in newborn infants with respiratory distress syndrome. AJR Am J Roentgenol 1979;133:417-21. Williams DW, Merten DF, Effmann EL, Scatliff JH. Ventilator-induced pulmonary pseudocysts in preterm neonates. AJR Am J Roentgenol 1988;150:885-7. Glustein JZ, Kaplan M. Enterobacter cloacae causing pneumatocele in a neonate. Acta Paediatr 1994;83:990-1. Papageorgiou A, Bauer CR, Fletcher BD, Stern L. Klebsiella pneumonia with pneumatocele formation in a newborn infant. Can Med Assoc J 1973;109:1217-9. Bermejo Velasco E, González Molina E, Martinez Ayucar M, Zubia Aguillo A, Nieves Gil A, Salado Marin C, et al. 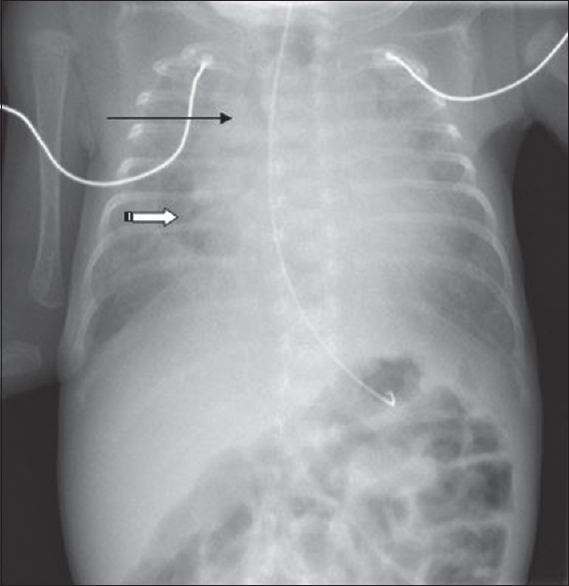 Pneumatocele as a complication of E. coli pneumonia in a newborn infant. Apropos of a case. An Esp Pediatr 1992;37:526-8. Rohana J, Lau DS, Hasniah AL, Faizah MZ, Boo NY, Shareena I. Pneumatocoele in a neonate with perinatal tuberculosis. Arch Dis Child Fetal Neonatal Ed 2013;98:F121. Pfleger A, Eber E. Assessment and causes of stridor. Paediatr Respir Rev 2016;18:64-72. Jiang JH, Yen SL, Lee SY, Chuang JH. Differences in the distribution and presentation of bronchogenic cysts between adults and children. J Pediatr Surg 2015;50:399-401. Stewart B, Cochran A, Iglesia K, Speights VO, Ruff T. Unusual case of stridor and wheeze in an infant: Tracheal bronchogenic cyst. Pediatr Pulmonol 2002;34:320-3. Goswamy J, de Kruijf S, Humphrey G, Rothera MP, Bruce IA. Bronchogenic cysts as a cause of infantile stridor: Case report and literature review. J Laryngol Otol 2011;125:1094-7.